Brock takes a call from Shore Leave, where Topic A of the conversation is, for the third time, Brock’s gun, which by now must be bursting with the need to go off. But the reason for the call is to warn of an impending attack from Wide Wale, who, we learn, was once a doctor working on a cure for cancer, but, things being as they are in the super-science world, is now part whale. It makes Wide Wale something of an outlier himself in the Venture universe, in that he sustained his identity-defining trauma while an adult, and while engaged in a noble pursuit. 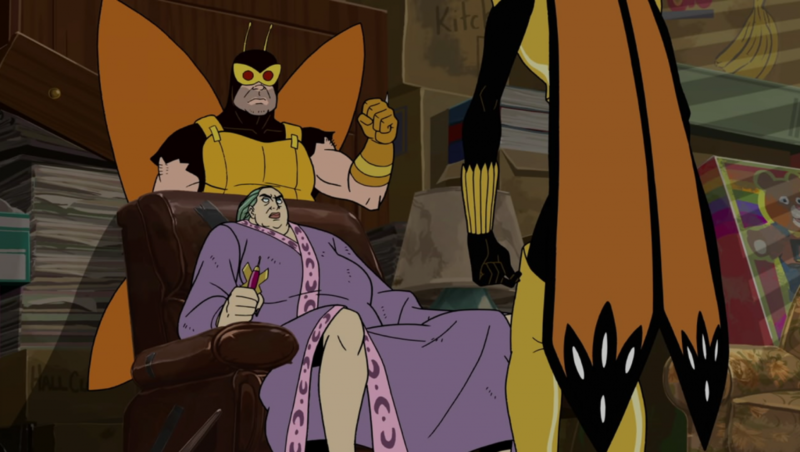 Contrast that with the Monarch, who assembled his identity in a moment of deep trauma from whatever happened to be around at the moment, or Phantom Limb, whose villainy stems from parental neglect and personal disfigurement. Back at St. Cloud’s place, St. Cloud finally gets around to revealing his grand plan, if one can call it that. He has re-built (or purchased) the principal set from the Duran Duran “Is There Something I Should Know” video, and has assembled (in his own mind) a narrative that gives weight and depth to the smallest of props from the video. The ball, in St. Cloud’s mind, or so he says, is a talisman for an entire cultural stream, the linchpin of a significant artistic movement. What is going on here? On the one hand, St. Cloud’s rant is bizarre and nonsensical, the narrative he’s conjured up can only make sense to himself. On the other hand — and this is the important part — St. Cloud has the ball, and Billy does not. Which underscores another of the themes of the show, touched on yesterday, that the hero/villain dyads of the Ventureverse don’t need a good reason, or a reason at all, to antagonize each other; they will, if necessary, manufacture a reason, and then inflate it to the scale of a grand master plan to destroy the world, if only in their own minds. St. Cloud threatens to send the ball back in time to the Old West (which, given a generous interpretation, is suggested in the glib, 80s surrealism of the Duran Duran video), which, theoretically anyway, would destroy the chain of artistic creation outlined previously. Is there any sense to St. Cloud’s threat? Could removing a prop from an 80s video alter history? Wouldn’t Duran Duran’s video director just find a different ball? Would that change things? Are we talking about a “Sound of Thunder” situation here, where the smallest changes to the time-stream alter the present irrevocably? And that’s even assuming that the other prop present, a red pyramid that St. Cloud says is a time machine, is, in fact, a time machine, and not just a red pyramid built for a music video. But, as I say, after a certain point it doesn’t matter; the only thing that matters is that St. Cloud has the ball and Billy wants it. He did own the ball, after all, so it did mean something to him. 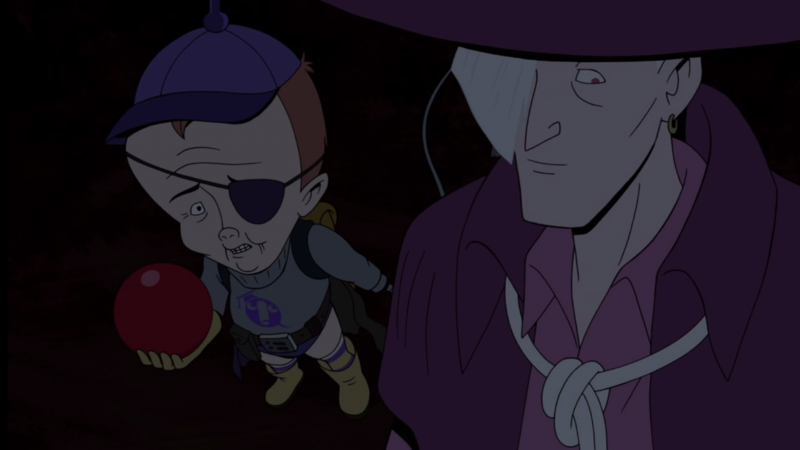 Perhaps it connected him to his youth (as so many things in the Ventureverse connects characters to their youths), perhaps that moment of cultural history possesses great meaning to him for reasons yet explored. 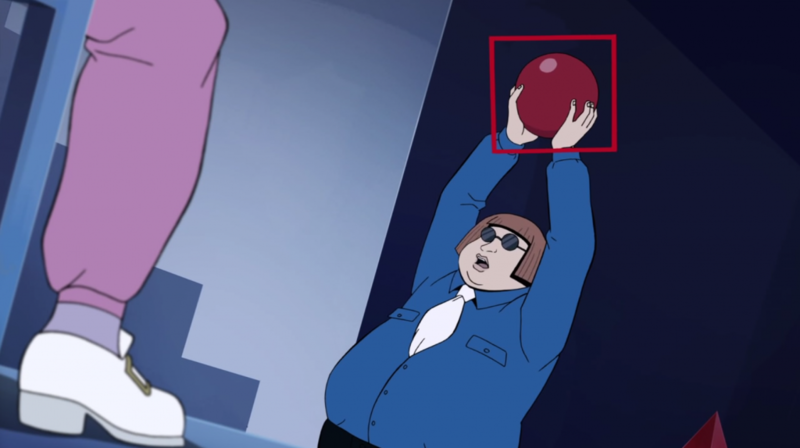 For all we know, the ball isn’t even the same ball from the video, it could have been an identical ball of thousands made, or a replica made at a prop shop. It wouldn’t matter; the only thing that does matter is that Billy attaches significance to the ball, and St. Cloud has it. The ball, and the era it represents, could be just another piece of crap, a cultural hairball coughed up by the corporate culture of our most corporate-culture era. But, as with Jonny Quest and Batman and James Bond, that culture nevertheless enters the minds of children and helps them form their identities. What St. Cloud wants is Billy’s business, Conjectural Technologies, in exchange for the ball. His conflict is the Monarch’s writ small — he wants to humiliate his chosen arch-enemy, take away everything he has. For Billy, we learn, that’s a small price to pay for retaining his identity (and its attendant props). 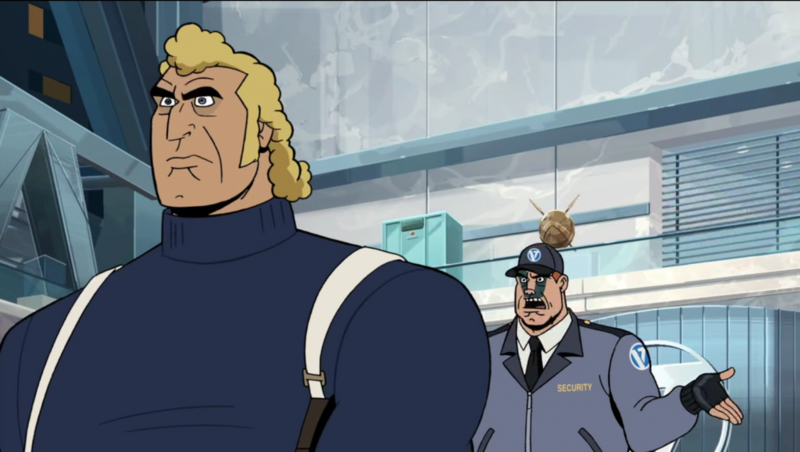 Meanwhile, Brock, who needs a full squad of OSI members to fend off Wide Wale, has to make do with Sgt Hatred, whose worth is primarily his inside knowledge of the Guild. Elsewhere in the Venture compound, Rusty lays out his vision for the new Ven-Tech industries: high-flown super-science, a list of ideas that range from idiotic to repulsive, each doomed to fail, if only because Rusty is the one creating it. Rusty dreams of building on the dreams of his father and grandfather, neglecting that they, unlike him, were visionary geniuses and he is a crabby, selfish autocrat. The Pirate, in pirate-voice, lectures Rusty on corporate reality and “products what need updates.” “Arr, ye have to pay the bills,” he says, making him the most pragmatic pirate in history. Dean, by far the most emotionally intelligent one in the room, steps forward with a solution: keep the facade of the super-successful corporation running, but invest in a division that will still create super-science. It’s a perfectly reasonable idea, which makes it all the more shocking; giving the slightest bit of thought to the matter, Rusty, it seems, could actually succeed and be happy. Out in the desert, Billy and Pete reflect on the deal they made. They’ve given St. Cloud everything they have in exchange for the ball from a Duran Duran video, a useless collectible, but an emblem of Billy’s dreams. There is some more discussion of alternate time lines and the probabilities of a different culture arising, but the argument is moot: with no proof that anything St. Cloud talked about was real, the decision to give up everything for the ball was entirely personal. The ball contained Billy’s dreams, and that is all, but, like the Monarch with his arching, or 21 with his henching, or Rusty with his super-science, the continued failure is nothing compared to the inability to give up his dreams. 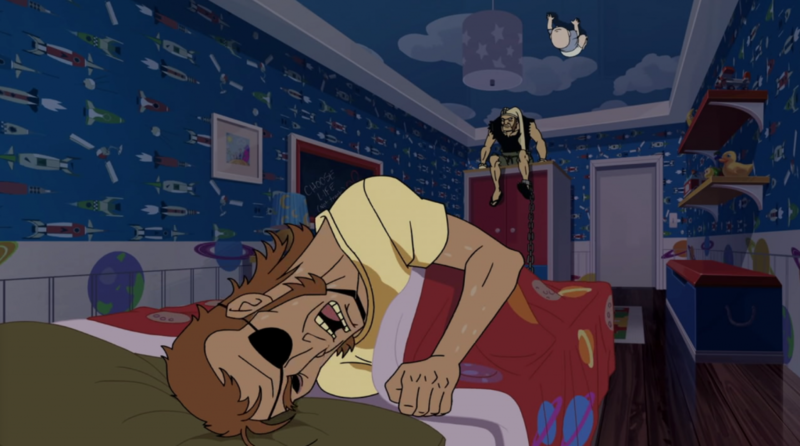 On The Venture Bros, dreams (and their props) are all some characters have. At Venture HQ, Wide Wale comes up through the lobby floor in his impressive Whale-sub-thing, only to find he’s been “stood up” — he’s come to arch someone and there is no one there to be arched. Instead, a piece of bait has been set out: an ancient Aztek mask, from one of Jonas Sr.’s adventures in the 1960s. The bait, of course, is, like St. Cloud’s Truckasaurus, only a distraction, this time a distraction in reverse. Using only Sgt Hatred’s skills as a tour guide (and an ex-Guild-member), Brock and Hatred keep Wale occupied stealing from the Venture lobby while they head across the street and fill Wale’s apartment with balloons and, yes, the polar bear from the zoo. Brock’s Chekhov’s gun never goes off, and, it’s noted, was never even loaded. It, too, was a distraction, to lure the viewer down a specific garden path while setting up a gag no one could have seen coming. Brock, trained to kill and ruthless in his violence, instead treats Wale as he should be treated: as a clown, a tiny man with tiny dreams, a man who could have been great but clung to the petty dream of arching. The Monarch and 21 depart from the city bus and congratulate each other on a fine day of super-villainy. In a rare moment of tenderness, they bond over what was, most likely, a pointless exercise. His scheme to get to Rusty, the Monarch recognizes, is probably all for naught, but the important thing was the time spent with his friend 21. His friendship is almost instantly rewarded as Manolo, their handyman, reveals that he has found, in the Monarch’s basement, a secret lab, just the tool the Monarch will need to up his arching game. In the epilogue, Billy’s and Pete’s defeat suddenly turns to triumph as, unknowingly to Billy, his dreams and Rusty’s dreams have coincided, and Rusty has (overnight, it seems) purchased Conjectural Technologies from St. Cloud (“at a considerable profit,” he gloats, perhaps forgetting the money he spent building the set from the Duran Duran video) and plans to install them as the super-science dream-center of Ven-Tech. This, doubtless, will create many new opportunities for failure, but for now, it is proof that holding onto one’s dreams is the path to salvation. 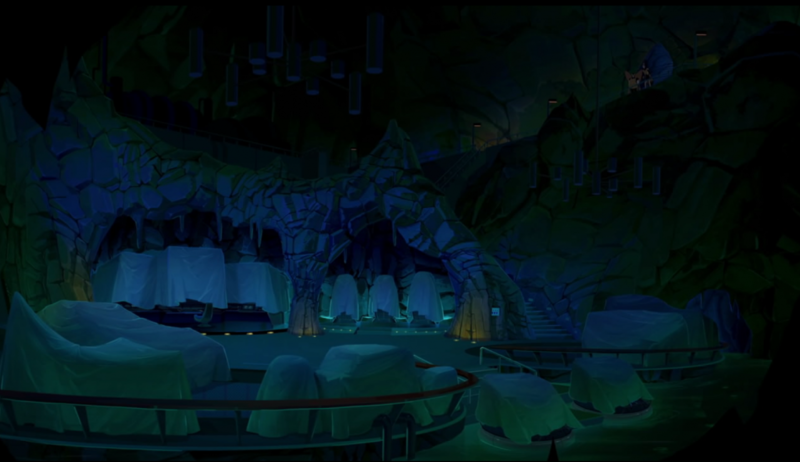 Secondly, this provides even more justification for Wide Wale to be so interested in arching Dr. Venture. He doesn’t care about Rusty at all; he’s knows that he’s poaching from The Monarch, and he’s doing it specifically to harass The Monarch. Wide Wale’s brother’s name wasn’t Arthur. It was Douglas Ong (i.e., Doug Ong, i.e., dugong). I think the intent in St. Cloud’s monologue about the ball is to establish it as an important historical artifact like a priceless Aztec mask. It equates Billy’s nerdy collecting to something as noble as Indiana Jones. Why do we value artifacts? Because they provide insight? Because they inspire us? Or is it because their rarity lends prestige to its owner? I think the overall point is that ‘pop culture’ is just as important as ‘culture’ and ‘history’. 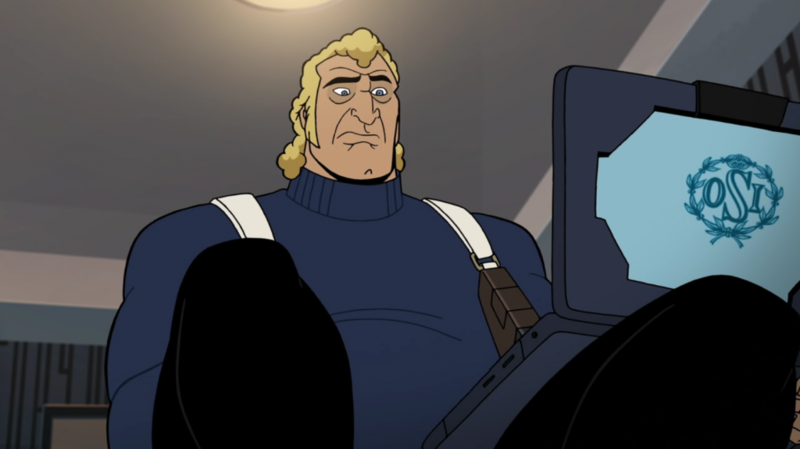 You’re kind of made of a mistake about the joke about Brock’s gun: he stated in the first few seconds of it being mentioned that it wasn’t loaded. Everyone keeps bringing it up because it was stated all the way back in season 1 that Brock made it a point to never use or even carry a gun. Now that Doc is a top level OSI client instead of a washout, Brock can’t just do whatever he wants to anymore. He’s required to carry a firearm, because the top brass are watching him. But he loopholes it by leaving it unloaded. Just because someone says a gun isn’t loaded doesn’t mean it’s not loaded. Rather, pointing to it repeatedly suggests that, when the time comes, it will be loaded. One thing I appreciate about this episode is the O’Henryesque nature of the time machine. Was it real or not? and the answer is it doesn’t matter, its Billy’s belief and the nature of the story that’s most important. I have been reading your excellent summaries for years now but this is the first time I’ve been up-to-date enough as a viewer to comment in real time. Fascinating that this little cartoon show has spanned so many delivery methods and paradigms.